Not so scary but my contribution to halloween this year - the usual dense, sticky and gooey choc mud cake - think this recipe can now be classed as achieved and a definite success! 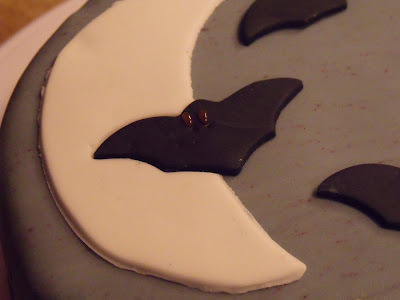 I love how in making grey - my fondant has flecks of the other colours that combine to eventually make black - it makes me think of a strangely clear sky with spooky lights and wisps of cloud floating past! 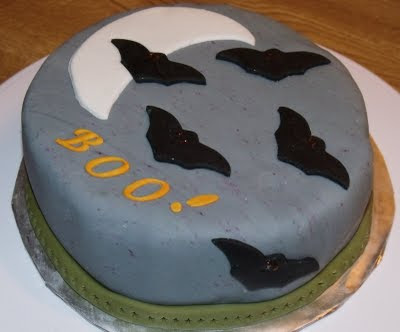 And my bloodthirsty bats are out in force to hunt their prey - those foolish enough to go trick or treating! We'll be ok as we've got a baby bat coming with us this year!